Gallia Academy sophomore Koren Truance (15) boots a free kick during an Aug. 30 match against Fairland at Lester Field in Centenary, Ohio. 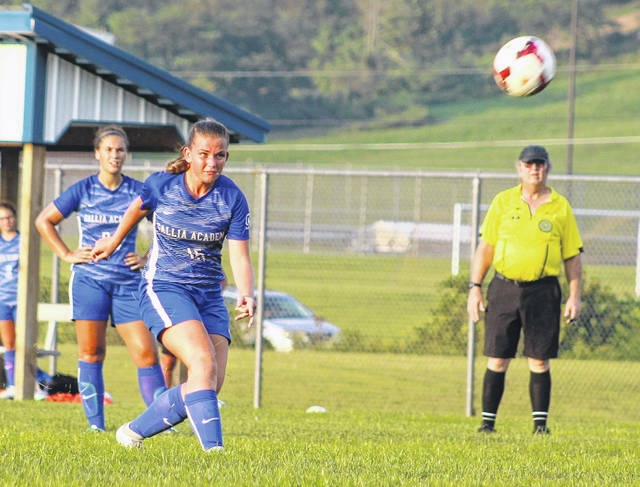 The Gallia Academy soccer teams now know their postseason fates following Sunday’s 2018 Division II Southeast District tournament drawings for both boys and girls. The Blue Devils (7-3-2) came away with a six seed and will travel to third seeded Marietta (6-4-1) for a sectional final at 5 p.m. Thursday, Oct. 18, in Ohio’s First Settlement. The Blue Angels (10-2-0) — who captured the OVC championship in the program’s first year of existence — prepare for their go-around in tournament play, earning a three seed while hosting sixth seeded Athens (2-4-6) in a sectional semifinal at 5 p.m. Tuesday, Oct. 16, at Lester Field. The GAHS girls need a win to advance to the sectional final, where the winner of the Waverly-Logan Elm contest awaits. The sectional final will be played at 11 a.m. Saturday, Oct. 20. Visit seodab.org for complete pairings of the 2018 OHSAA Southeast District Division II boys and girls soccer tournaments.